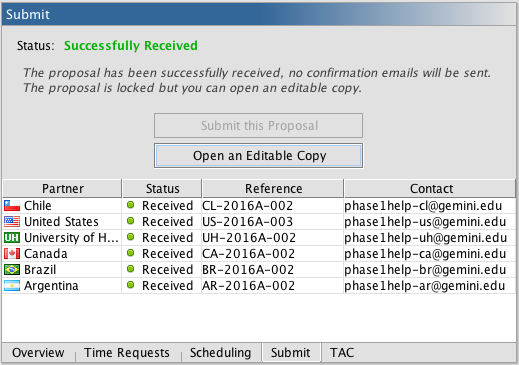 This is the top left panel of the PIT, when "Submit" is selected from the "Overview / Time Requests / Scheduling / Submit /TAC" options shown below the panel. A video tutorial is also available for this section. Confirm that the partner(s) listed accurately reflect your intentions. If there is an error, correct this using the Time Requests tab. If the status is not shown as "Ready", in green, then add the required information, or correct the error, as indicated in the Problems tab. 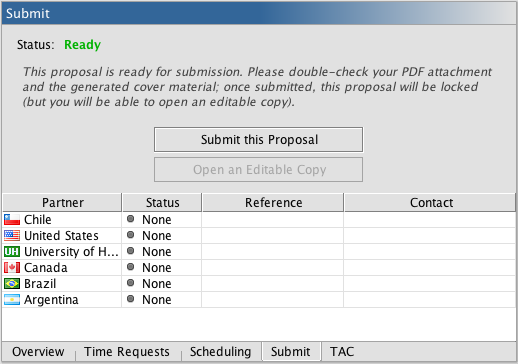 If the proposal is ready and final, then click the "Submit this Proposal" button. When the proposal is successfully received by each partner's server, the stoplight indicator will turn green. A "Received" in the submission status and the display of the reference number and contact information is your confirmation that the proposal was received. You will not receive a confirmation email. Information about any errors will be displayed in a popup window and can be viewed if you hover the pointer over the error icon. If you get the error that the backend is configured to accept proposals from a PIT for another semester, then please use that PIT for the submission. If there are communication problems then the submission will time-out after one minute. Continue trying to submit until the submission to every partner associated with the proposal is successful (partners whose submission was successful will not receive multiple submissions). If there are other errors then please submit a Gemini HelpDesk ticket. Once the proposal is submitted you cannot make any changes to the file. However, you can open an editable copy using the button below the submit button, which can be used for additional submissions in this or future semesters. If you have any questions or problems either send an email to any of the contacts listed or submit a Gemini HelpDesk request. The TAC tab is for national and international time allocation committee use only.